Are you considering your next career move as a Building Surveyor? It’s a common misconception that the National Trust is looking for Building Surveyors who are experts in conservation. While it’s true that we do need experts to help us look after our special places, we also put a lot of effort into training our people to become experts in their disciplines; this includes training in conservation. 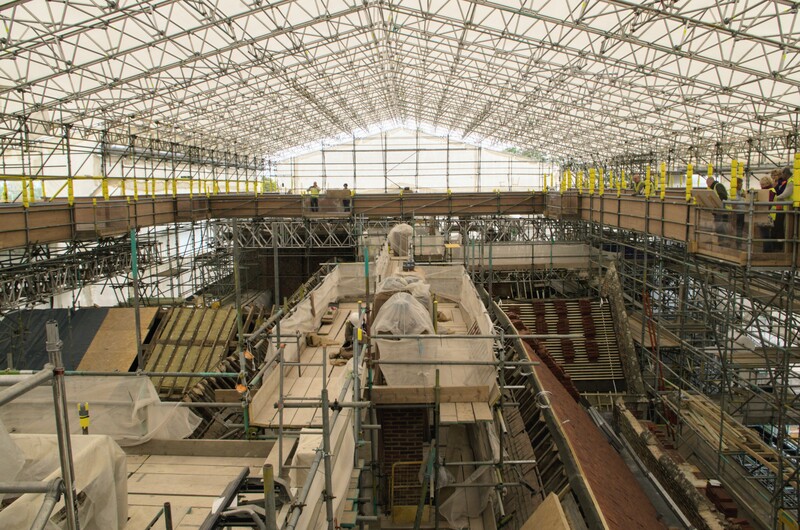 The new roof project at The Vyne is a perfect opportunity to really get a feel for what our building surveyors and other talented individuals do. Taking over three months to put up, the scaffolding that surrounds the project is fully accessible for visitors of all ages and abilities. We caught up with Lead Building Surveyor for the project, Andrew Harris, to discuss what inspires him to come to work every day. Was working for the National Trust something you’d always wanted to do? Absolutely, I’ve always been interested in history and historic buildings. Since qualifying as a Building Surveyor I wanted to work with the National Trust because of the variety of projects I could be a part of, as well as the historic buildings I could work with. I wasn’t sure if I stood a chance of being accepted though, to be honest, because when I started I didn’t have a lot of conservation experience. I applied and was accepted and the National Trust has some great training schemes to cover conservation. I haven’t looked back since! Can you tell us what is so special about a project like The Vyne? We’re replacing the roof of this 16th Century building. We’re replacing the tiles, making sure the structure is sound, that need is even more apparent when you see the leaning chimneys, and also making sure the building is compliant with the modern world. We’ve added in some insulation, as the original Tudor building didn’t have any, as well as protection against fire, all while making sure everything we do is in keeping with the history of the building. We’re careful to make sure we only add to the historic value and don’t take away from it. One of the most special elements of this project has been the chance for visitors to come up and get involved in what we’re doing. It’s a once in a lifetime opportunity for them. To be above a 16th Century building and to talk face to face to some of the experts we have working here. It’s been amazing. What is it you enjoy most about working for the National Trust? Honestly, it’s the variety of work and all of the different styles of buildings and projects I’ve been a part of. Every day’s a school day for me, I’m always learning. We work with some incredibly skilled people and real experts in their fields. I’m very fortunate. Is there much variety? Isn’t it all just old mansions? There’s so much variety! With the National Trust, it’s not all historic buildings, although that is a big part of it. I’ve been part of projects like this which dates back to the Tudor period, but I’ve also been part of a project to install a hydroelectric turbine in London. It’s real cutting edge technology! We want to bring some of our buildings more up to date with things like the insulation and green technologies like solar panels. Seeing a job from start to finish. It’s amazing to see all the effort that goes in behind the scenes. It’s also amazing, on projects like this one, to share that journey with the visitors who are really eager to learn. I find it a real privilege to work on these buildings. Can you tell us a bit about the other specialists you work with? We work with some real specialists in their fields. There are experts like archaeologists who are interested in the house and timbers etc. We have curators who specialise in the way things are meant to look. Conservators and the property team who look after the main house, and of course volunteers! Just to keep this scaffold up to welcome our visitors, it’s staffed by over 100 volunteers! We also work with outside contractors. Specialists like architects, structural engineers, quantity surveyors. Everyone is important and integral to keeping the projects moving. We work with such wonderful people who have a real passion for what they do. Have there been many bumps in the road to get here? There’s always logistics and obstacles to overcome, but a big issue for us was the bats! Bats are a protected species in the UK. So when I started here back in 2015 we had to think about things like bat surveys et cetera. We worked with expert ecologists to plan the work around the nesting seasons so as not to disturb them. Do you have any advice for people wanting to join the National Trust as Building Surveyors? You don’t need conservation experience. A lot of surveyors here join the National Trust without a lot of conservation experience but the National Trust is really good at training us up to become experts in our field. There’s lots of on the job training, so take advantage of it. If you’ve got an interest in history or historic buildings and would like to learn more about working for the National Trust in surveying, please get in touch, we’d love to hear from you!